This fungus may affect a wide range of ornamental trees and shrubs. Symptoms include white, powdery coating (fungal mat of mycellium) on the tops of leaves, distorted or stunted foliage, shoots, flowers or fruit. 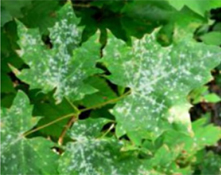 Chlorosis, browning and premature death of leaves, and slower growth are all symptoms of infection by powdery mildew. Repeated infections can cause decline and death. The mildews that affect roses and hawthorns overwinter in buds and infect new growth, but many mildews survive winter in special fruiting structures and release spores from them the following season. 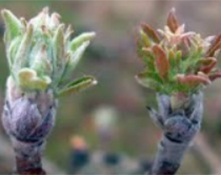 Powdery mildews that overwinter in buds may disfigure or prematurely kill new growth. Spores travel on air currents to infect susceptible host plants. Rain inhibits spore germination, but high humidity may make the disease more severe. Dry weather that is cool at night and warm during the day favours the development of powdery mildew. 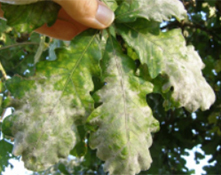 Fungicides may be needed to manage powdery mildew. Apply at the first sign of the disease and repeat every 10-14 days as required. Rotate fungicides with those from other chemical families to avoid resistance. Do not exceed a maximum of four applications per year. Powdery mildews appearing on plants late in the season may be considered cosmetic and generally do not require fungicides. Rake up and discard infected leaves to reduce the amount of fungus overwintering on leaf litter. Avoid practices that encourage succulent growth such as heavy fertilization and excessive pruning. Avoid overcrowding plants. Plants in shaded areas may be more prone to mildew. Avoid overhead watering in late afternoon or evening.